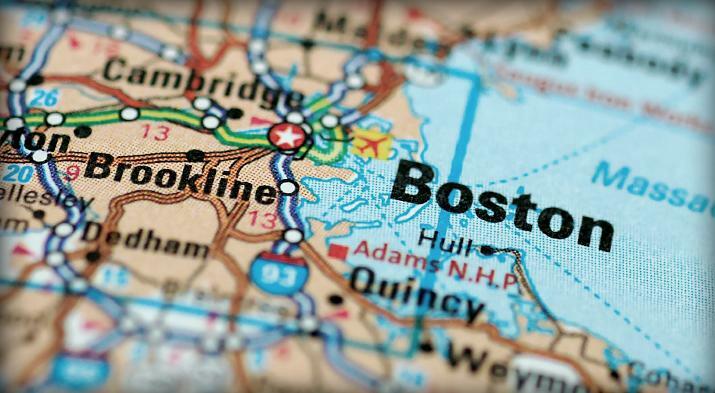 First off, I want to let you all know that I’m safe here in Boston. I had work on Monday, so I was in rehearsal when the explosions happened. It’s been a weird week for everyone, I think. Some of my colleagues haven’t experienced anything like this, and certainly not the militarization of a city that occurs in the aftermath. Walking down the street while packs of city police, state police, national guard, and SWAT congregate, weapons in hand, can take some getting used to. Everyone seems to have a different strategy for dealing with the ensuing nerves. Some avoid eye contact. Some look and smile (or smirk, as I do). Some give a wide berth while others will make a point of walking nearby to prove they’re not afraid. But any way you slice it, we’re all nervous but determined to go about our business. With that in mind, I’m offering you a simple sweet and salty treat to distract from the troubles of the last week. Obviously, bacon makes everything better; and this is so easy, it’s one of my favorite party treats. Sometimes I’ll make them earlier in the day, if I’m having people over for dinner, as a nibble while I finish the main course or as dessert afterwards. They hold beautifully at room temperature and refrigerate and freeze well. 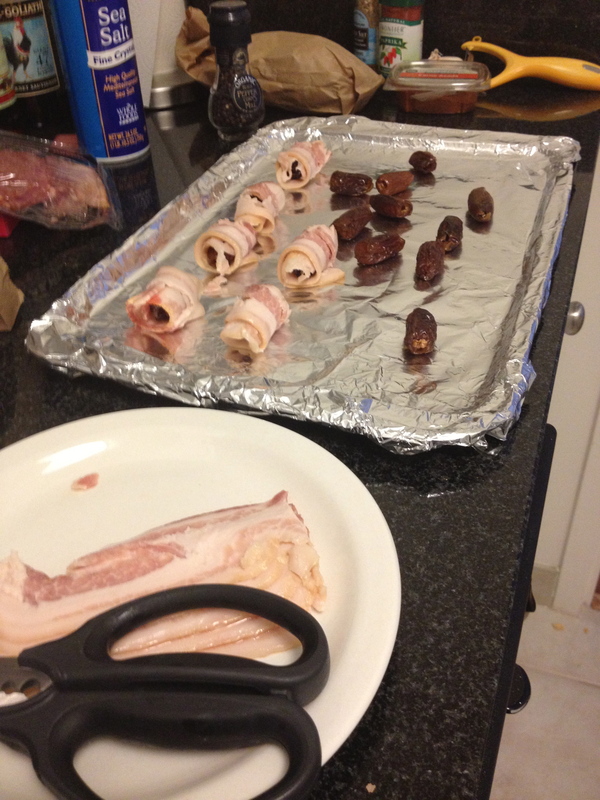 You could feasibly stuff the dates with other things before wrapping them in the bacon (blue cheese, slivered almonds, garlic, and chorizo are popular options), but I’m too lazy most of the time, and I think they’re delicious in their pure form. Line your baking sheet with foil. Given the sugar from the dates, you’ll thank me. Cut your bacon slices in half. Half a slice is usually plenty to wrap around a date. Wrap each date and place, seam side down, on the sheet. At this point you could secure the bacon with a water-soaked toothpick, but usually just making sure your seam is firmly placed on the sheet will do the trick. Place in the oven for about 25-30 minutes, remove and drain your nibbles on paper towels. Depending on how crisp you like your bacon, you may want to leave them in a little longer or a little less. Also, please let these cool down. They’ll be molten on the inside for a while after the outside has cooled, so take caution. 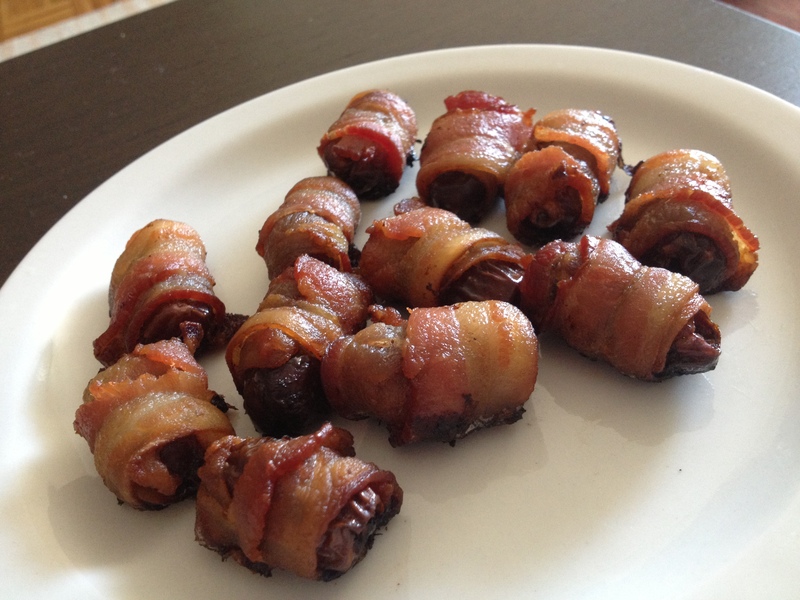 You inspired me to have prosciutto wrapped prunes for an afternoon snack. Mmmmm 🙂 Thank you. Brilliant! I’ll have to try that for myself! Way to riff on the theme!